Lord Grantham would never bone the maid. 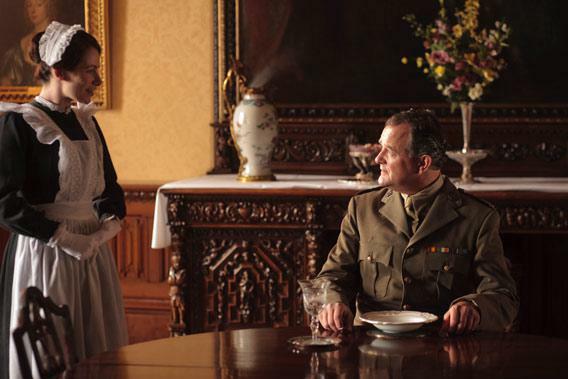 Lord Grantham would never bone the maid! Nick Briggs/Courtesy of © Carnival Film & Television Limited 2011 for MASTERPIECE. So, we’ve gotten to the point in the TV Club when we discuss who will “bone,” have we? Dan, I’m shocked to hear you say, with such conviction, of Lord Grantham and Jane the maid, “(They will bone soon, I’m certain. )” So much folly in one parenthesis. Were it any other toff in Tofftown? Sure, they would bone. But even though Julian Fellowes has given Lord Grantham a couple of flaws this season—a little pomposity here, a little selfishness there—there’s no way that this paragon of progressive, upper-class tolerance and marital affection would screw the housemaid. He might lust in his heart, and maybe a little bit more, but he’s not going to pull an Arnold Schwarzenegger. When can I take off this armband? Editor’s note: For the benefit of American readers who haven’t yet seen Season 2 of Downton Abbey, please do your best to avoid spoilers when commenting.